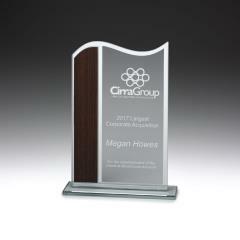 Give awards that truly stand out with stylish glass awards that represent true gratitude and appreciation. In the Awards and Trophies range you'll discover a wide array range of glass products, extremely popular in corporate industries. Choose yours below and take advantage of our FREE engraving offer. Glass awards make for the perfect trophy to adorn the mantelpiece of any corporate office, employee desk or retiree’s shelf. Awards and Trophies is Australia’s premier online supplier of glass trophies so whether you need items for sales awards, corporate recognition awards, or appreciation and achievement awards, we have a diverse selection to choose from. Every year we add new and stylish glass awards to our extensive online collection so your company will never have to present the same glass trophys twice. All glass awards from Awards and Trophies are available for a flat shipping rate of $9.90, making us more affordable and convenient than any other trophy provider. Featuring jade, blue and clear glass, combination awards with glass, chrome & polished wood, and glass clocks, these elegant trophies are increasingly popular. 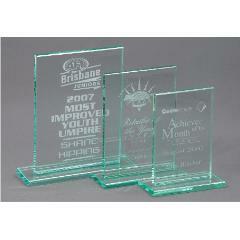 Many of our glass awards and trophies come in gift boxes to enhance your award presentation. Order your glass trophies and awards online from Awards and Trophies and receive the most exquisite items in no time at all! Browse our collection online now.